Preheat the oven to 375 F. Coat an 8x8 inch baking pan with cooking spray. In a large bowl, combine the oats, flour, sugar, cinnamon, baking powder, salt, & vanilla, and stir to mix well. Add the margarine and cut it quickly into the dry ingredients with two knives until the mixture resembles coarse meal and is no longer powdery. Do not overmix-bits of margarine will still be visible. Set aside about half of the oat mixture; press the rest of it firmly into the pan. Bake until lightly browned at the edges (but not fully baked). 13 to 15 minutes. Meanwhile, mix the preserves with the spinach puree in a small bowl. 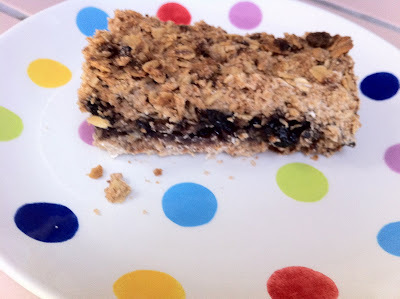 Spread the blueberry mixture over the partially baked oat layer, then sprinkle with the reserved oat mixture. Bake until the topping is slightly browned, 20 to 25 minutes. Set the pan on a rack to cool completely before cutting into 12 bars. Prep: No prep at all for baby spinach. For mature spinach, fold leaves in half lengthwise witht he stem outside, then strip the stem off the leaf. Cook: Steam for 30 to 40 seconds, or cook in a skillet with 1 T water for about 90 seconds, or just until wilted. (I steamed mine in the microwave for 2 minutes in a covered glass dish). Puree: In a food processor or blender for about 2 minutes until smooth and creamy. The kids loved these. The first time I made them they knew I used a secret ingredient but didn't want to know what it was. This time, they knew what it was and didn't care. What a great way to get some iron & greens into a healthy snack!!! 1. In a large saucepan, saute potatoes, carrots, celery, onion, and garlic in butter for about 5 or 6 minutes. Add broth, cover and cook until vegetables are tender, about 10 minutes. 2. In a small bowl, combine flour and milk until smooth. Gradually add to vegetable mixture. Bring to a boil; cook and stir for 2 minutes or until thickened. Add the remaining ingredients; simmer 5 minutes longer. 3. Fit crust onto a pie tin. Pour hot filling into crust. Place the second crust on top; crimp edges. Cut slits in top of crust. 4. Bake at 350 for 35-45 minutes or until crust is light golden brown. Serves 6. 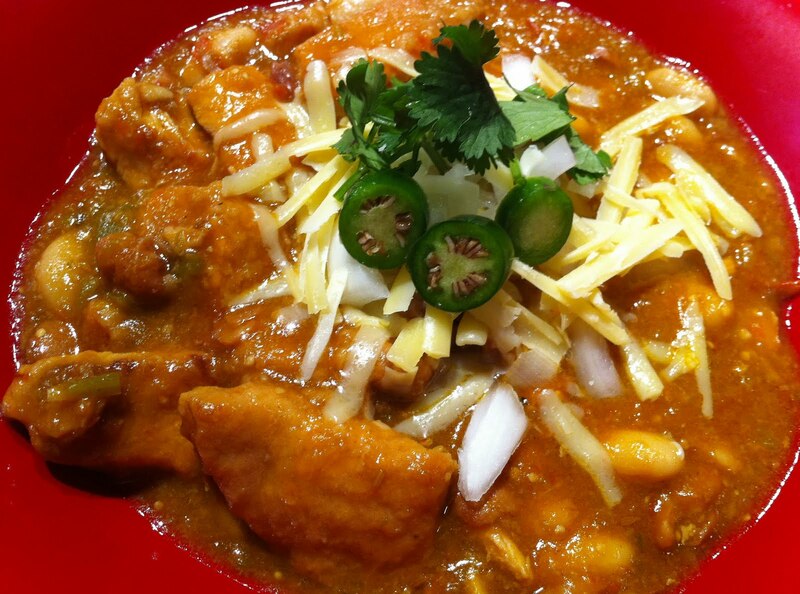 Typically, Chile Verde doesn't have beans, but I was shooting more for a chili with pork & green sauce. However, the red bowl kind of threw off the color, so it doesn't look as green as it should. Also, I added a can of stewed tomatoes, when I probably should have used 2 jars of salsa verde instead. Oh well. The bottom line is that it was delicious!!! Put the flour and some salt and pepper in a large ziplock bag. Add the pork, zip up the bag, and give it a good shake to coat the cubes. Heat 2 T of the olive oil in a large skillet and brown the pork for about 3 minutes on both sides, in batches. Set aside. In a large pot, heat the remaining 2 T olive oil and saute the fresh vegetables until softened, about 8 minutes or so. Add the spices and cook for a minute. Add the stewed tomatoes, salsa verde, & chicken stock. Bring to a boil, reduce to a simmer, and simmer for 30 minutes. Add the pork and simmer for an hour. Check your spices; I always add a little more cumin. Now add the beans with a little bit of the liquid and simmer very gently for 15-20 minutes. Garnish with diced onions, cilantro, jalapeno, & white cheddar cheese. Serves 4. 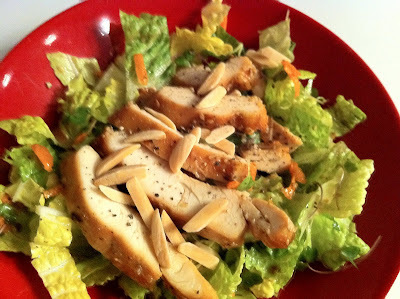 I broke my Italian theme last night and made a Chinese Chicken Salad. I felt like something lighter after all the heavy pasta dishes I've been making. (And I wonder why I can't lose the last 10 out of 15 pounds I've gained this winter! ;) Anyway, my 13 year old wanted nothing to do with this salad, but my husband and I enjoyed it. My inspiration was the bottle of Toasted Sesame dressing I bought last week. Its made by one of my all time favorite food companies: Soy Vay. I use their Veri Veri Teriyaki all the time as a marinade. Its sublime!! Marinate the chicken in the teriyaki sauce for at least half an hour. Preheat the oven to 350 and bake the chicken on a foil lined cookie sheet for 20 minutes. Set aside to cool, then slice. Toss the vegetables (Feel free to use any veggies that you have on hand! Bell peppers would make a nice addition!) and the almonds with the dressing. Divide into two salad bowls. Add the chicken slices, a few more almonds, and the cilantro for garnish. Serves 2 with leftovers. Enjoy! Bring a large pot of water to a boil. Add ravioli and cook for about 8 or 9 minutes until done. Reserve one cup of the water, set aside. Right before you drain the pasta, add the frozen peas and stir until slightly blanched. Drain, set aside. Meanwhile, saute the prosciutto in the olive oil for about 5 minutes, until crisp. Stir in the garlic & tomato paste and cook for about a minute. Add the water from the pasta and simmer for about 4 minutes, or until it has reduced by half. Remove from heat and stir in the half and half. 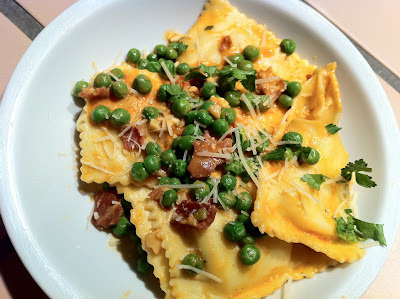 Toss the sauce with the ravioli & peas, garnish with parsley & grated Parmesan cheese. Position rack in bottom third of oven and preheat to 350°F. Cook bacon in very large pot over medium-high heat until brown but not yet crisp, stirring often, 8 to 10 minutes. Add smoked sausage, andouille, and ham. Sauté until meats start to brown, about 10 minutes. Add onions, celery, and bell peppers. Cook until vegetables begin to soften, stirring occasionally, 10 to 12 minutes. Mix in chicken. Cook until outside of chicken turns white, stirring often, 5 to 6 minutes. Mix in paprika, thyme, chili powder, and 1/4 teaspoon cayenne. Cook 1 minute. Add diced tomatoes with chiles and broth; stir to blend well. Add more cayenne, if desired. Mix in rice. Bring jambalaya to boil. Cover pot. 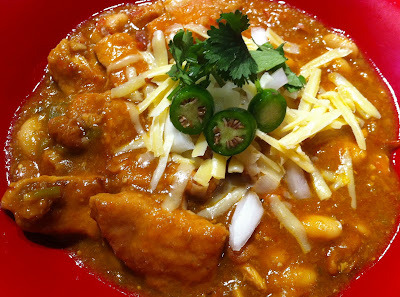 Place in oven and bake until rice is tender and liquids are absorbed, 45 to 48 minutes. Uncover pot. 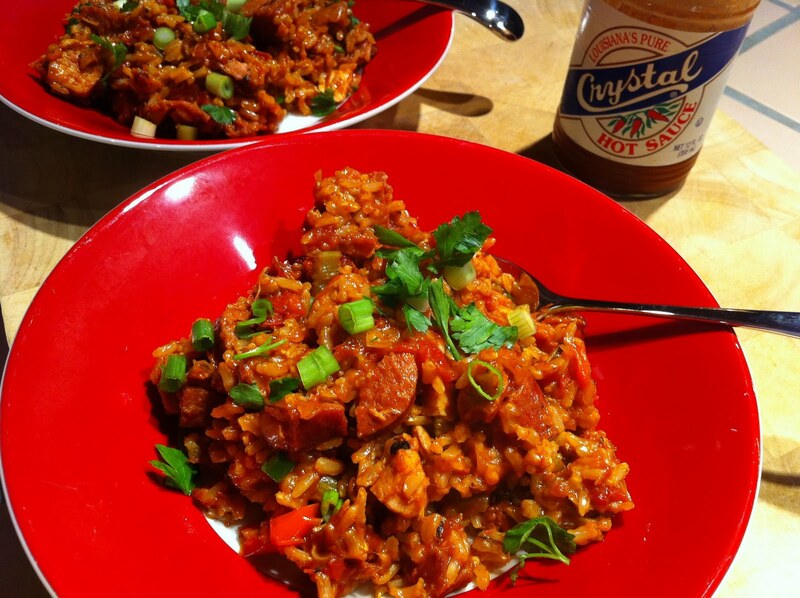 Mix chopped green onions into jambalaya; sprinkle jambalaya with chopped parsley and serve. Garnish with Crystal hot sauce, if desired. Preheat oven to 450. Bring a large pot of salted water to boil; cook 1 pound of pasta until very al dente, 3 minutes less than the label directs; drain. Drizzle with a tiny bit of olive oil to prevent sticking. Saute your zucchini in olive oil and set aside. Cook your sausage, drain, set aside. Heat 2 tablespoons olive oil in a large skillet over medium heat. Add the garlic and a pinch of red pepper flakes; cook until the garlic is golden, just a few minutes. Add the diced tomatoes & water into the skillet. Add the basil; simmer, uncovered, until the sauce is thickened, about 20-25 minutes. Discard the basil; season the sauce with salt. (you could also just use 4 cups prepared sauce and skip this step. 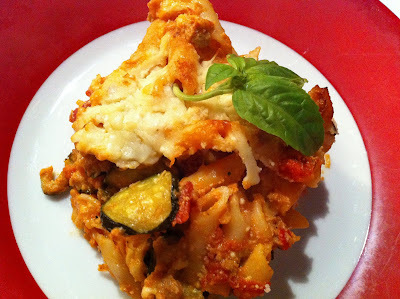 Toss the ricotta, zucchini, & sausage into the sauce and stir until the ricotta has incorporated itself into the sauce. Toss the cooked pasta and half of each cheese into the sauce. Turn the mixture into a greased casserole dish and sprinkle with remaining cheese. Bake, uncovered, until browned, about 20-25 minutes. Let rest for 15 minutes before serving.